A jazz drummer hits every note in her solo, and bends the rhythm in unexpected ways. A basketball player lands a three-pointer, then another, and another – he feels like he can’t miss. A professor delivers a lecture and keeps every student engaged and participating. Suddenly, two hours have felt like two minutes. A standup comic thoroughly “kills,” leaving the audience in hysterics. It’s as if he can do no wrong. These are all examples of flow. We’ve all experienced it, almost certainly more than once, maybe even on a daily basis. But more than likely, we didn’t have the words to describe it, or the framework to fully understand the psychological mechanics behind it, let alone the awareness of how to wield it to improve performance at work. Last week I delivered a presentation on flow to a group of fellow coaches, consultants and other entrepreneurial service providers. What follows is an introduction to the core concepts of flow and some suggestions for further reading. 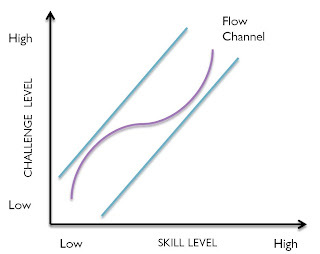 Flow state, also known as optimal experience, is the point at which your challenges align with your skills (see graph). The term also describes a process of acting with full involvement, energized concentration and enjoyment. The term was coined and developed by Mihaly Csikszentmihalyi (pronounced ME-high CHICK-sent-me-high-ee...yeah, good luck with that), a pioneer of positive psychology, who published a number of books on the subject (see below). Csikszentmihalyi aimed to explain the special feeling he experienced while rock climbing. Some call it being “in the zone,” “firing on all cylinders” or being "in the pocket" – regardless of the label, flow can be an incredibly powerful force – not only in sports and recreation but also in business. What Happens in a Flow State? Clear goals and immediate feedback. Video game designers have long understood and attempted to capitalize on this phenomenon. Part of what makes video games potentially so addictive is that the goals for each activity are clearly explained to you and you earn rewards or acknowledgement each time you achieve them within the game. Equilibrium between level of challenge and personal skill. 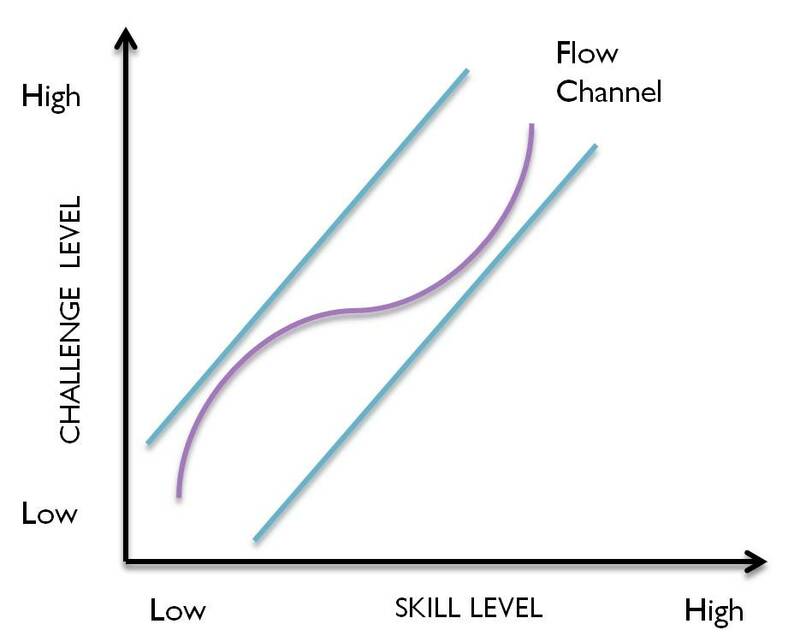 As the graph above depicts, flow emerges when the level of challenge entailed in an activity aligns with the individual's personal level of skill. This can happen through serendipity, but understanding the mechanics of flow can empower you to make proactive adjustments -- either decreasing the challenge or increasing your skills -- in order to facilitate flow for yourself. Merging of action and awareness. In flow you feel fully immersed in the activity, free of distractions. This is why people often refer to it as being in the "zone" -- this is an instance, not unlike a meditative state or trance, where consciousness takes on measurably different parameters. Intense, focused concentration on the present moment. That NBA player hitting three-pointers or nailing free-throws is somehow able to tune out the roar of the crowd. That's because flow state enables an incredible level of concentration that doesn't feel tedious or forced. Sense of potential control or agency over the activity. When challenge and skill achieve equilibrium, one of the byproducts is a heightened sensation of efficacy and the ability to influence the outcome. This feeling, not surprisingly, becomes a self-fulfilling prophecy that enables heightened performance. Loss of self-consciousness. You also lose any sense of self-doubt or concern for how others are perceiving you, despite whatever pressure or expectations might exist. Time distortion. When people enter into a state of flow, they often lose track of time, experiencing a subjective alteration in their perception of time. For some, time speeds up – suddenly three hours have past but only felt like thirty minutes. For others, time appears to slow down – think Neo in the Matrix – and they feel as if they can think faster and accomplish more than usual in mere moments. Autotelic experience – intrinsically self-rewarding activity. Whether it's the panoramic view at the top of the mountain, the applause from the crowd, or simply the knowledge of a job well done, flow can only be achieved when the activity entails some mechanism for self-satisfaction and gratification. Enhances performance and creativity. Flow makes you more productive and open to experimentation and outside of the box thinking that leads to breakthroughs and innovation. Prompts learning and new skill development. The inherently rewarding nature of activities conducted in a flow state incentivizes you to continually increase the level of challenge along with your skills to generate that rewarding feeling. Enables collaboration and co-creation. Major companies have been trying to tap into collective flow states to empower teams of employees to work together to be more productive and creative. Increases satisfaction, enjoyment and quality of life. Most importantly of all, flow makes us happier and more contented. It just feels damn good and produces terrific outcomes. Check out this video for a quick tutorial on how to use flow to combat anxiety and boredom in the workplace. The more I think about it, the more I realize that I've experienced flow in a variety of different activities. The one that sticks with me most is playing music. When I was playing drums in bands in high school and college, especially during longer improvisations, I would often find myself losing track of time and feeling a special sense of control and creative energy. It was as if I could do no wrong. At the time I didn’t have the terminology to describe this sensation, but now I can identity it as a flow state. Part of what makes art so rewarding for creators – and can sometimes lead to obsession – is this feeling of being completely immersed in and empowered by an activity. Recreation is one thing, but what about work? To be honest, until I started coaching I rarely felt myself reach a state of flow in a professional context. When I’m preparing for a coaching session or workshop, or actually working with a client, I often feel myself entering into this state of heightened awareness and empowerment. Now the challenge is to develop the level of skill necessary to achieve flow while tackling other aspects of the business – such as sales and business development – that don’t feel as intuitive and gratifying. For more information on flow, how to use it to increase productivity and creativity (for yourself or for your employees) please feel free to reach out to me via coach@inclusivastrategies.com. Nowadays people study a different kind of course or subject by which to get more knowledge so that they can grow easily in any field. Those guys who just need a degree for getting better rank in his/her faculty so they prefer to buy degree online without any problem. Online is the best tool for everyone, there are lots of information about the education, technology and more… Many students get an education from online in his/her faculty without any problem.